Bicycle speed depends on the power of pedaling, on type and class bicycle, on road condition and on wind and elevation. It is interesting to evaluate in what proportions. According to my experience, if on a smooth asphalt road cruising speed is 30 km/h, then on secondary road, it drops to 25, while riding in a group could grow to 35, a headwind can easily reduce the speed to 20 km/h and it is taken hardly. Upon uphill speed is easily extinguished, for example up to 15 km/h but it is taken normally. In network it’s postulated that even at speeds of 25-30 km/h the main forces go to fight against resistance of the air, and in general the speeds of more than 30 km/h are determined not so much by force of the legs but by aerodynamics. It is strange for me. According to my observations aerodynamics felt much stronger against headwind when it is necessary to really fight. But tailwind do not push forward because speed of bike usually greater than the velocity of the wind. But the speed of bike does not become very large. May be the value of aerodynamics somewhat exaggerated? Fortunately, not very difficult to estimate the distribution of forces during moving a bike. Then it is possible to compare these data with published observations of users in the network with a bike power meters. For begin it is interesting to understand what resources are available to cyclist. In the long pedaling main characteristic is output power. Judging by the reviews of owners of power meters you can give out 200 watts. This is in correspond on speed of 25 km/h to force of 28.8 newtons. For clarity, further I prefer to use units of kilogram-force. One kilogram-force (symbol “kG” as opposed to the masses – “kg”) is the weight of a body with a mass of 1 kg, it is the force with which the weight with sign “1 kg” weighs on the scales . This is what we deal with in everyday life, instead of the actual “mass of body”. 1 kG = 9.81 newtons. 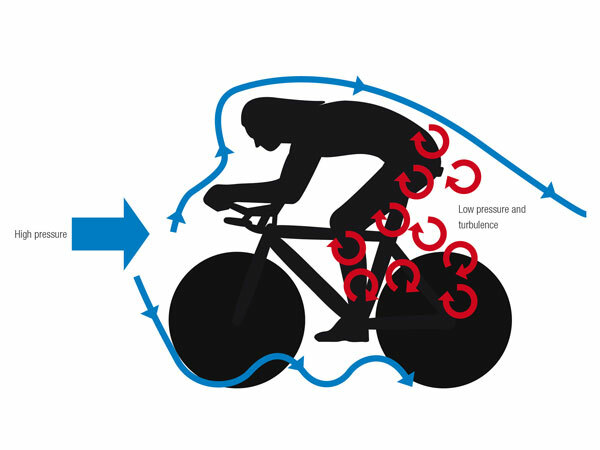 Accordingly, the 200-watt power output at 25 km/h is only 2.9 kG of force applied to the bicycle. It seems strange, because you can easily lift a lot more. But this is the because of difference between the work and the force. The load should not just raise but raise and raise, and quickly. Certainly in the short term it can be developed and more power and more forces, but over a long period is obtained about such figures. By the way, the power of the horse, 1 hp = 736 watts, only 3.5 times more than the capacity of the average cyclist. In steady driving vehicle resistance force (F) is determined by three factors: rolling resistance (R), hills (T) (expressed in weight gain, which is necessary to push to the mountain) and the drag of air (Q). The force of friction depends on the coeff. friction (k) and the component of weight (P) perpendicular to the surface. That is, the greater the weight, the worse the road, the worse the tires, the resistance due to friction is larger. Hills adds back pulling force (T) in dependence of the weight (P) and the angle (alpha), but somewhat reducing the pressure on the surface, i.e. the friction force. 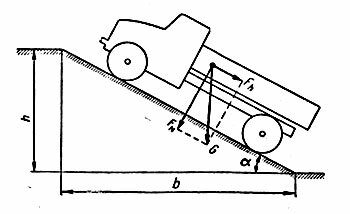 Finally, the drag force (Q) is proportional to the cross section square (S), the coefficient of aerodynamic resistance or drag coeff. (Cx) and the square of the speed (v), the factor (rho) is the density of air. In the first term R is the unknown coefficient of friction. More precisely, the coefficient of rolling resistance (k = k’ * r, where r – the radius of the wheel). It depends on the “rollings” of tires and on quality of road. Of course, can vary within wide limits, the data is difficult to find. For start, you can take for wheel on asphalt road k = 0.004, although there are data 10 times less and 4 times greater. If we compare with the forces when ride uphill such coefficient of friction will be felt as uphill with a slope of 0.4% that is virtually nothing 🙂 The kilogram-force is 0.36 kg. Appropriate hypothetical speed (no hills and no air resistance, such as a indoor trainer attached to bike) at 200 watts = 204 km/h. Do not look like the truth 🙂 Normally you can feel, roll a bicycle or not. Or this bike / tire / tire pressure / asphalt, etc. roll better, and that one over there – is worse. According to these calculations at speeds substantially less than 200 km/h such feelings should not be, all bikes must seem the same. The “aerodynamic” term of two parameters that affect the resistance. The first – “frontal” area. This parameter can be measured using similar photos. I’ll do it later, when compare calculations with experimental data. To estimate we can assume S = 0.5 m2. The second parameter Cx most mysterious. It is a drag coefficient, or coeff. of flow. For a speed of 25 km/h the aerodynamic drag force is found to be 0.75 kG, or will select only 51 watts from available 200 watts. And if you use all 200 watt to air resistance, the calculated speed will be equal 39 km/h, the according power of aero-braking will be equal to 1.9 kg. It is difficult to comment on. At 25 km/h air resistance is really not much felt, and 39 km/h is achieved in my case, the descent from the hill, and the downhill can give a huge plus to the power of pedaling. In general, the above estimation parameters (weight cyclist + bike = 90 kg, asphalt) for a ride to a small hill, that can not be felt as a slide = 1% (it is 1 meter uphill to 100 meters distance) available 200 watts will go to speed 30.7 km/h. Force spent: 15% to rolling resistance (0.36 kg), to uphill 38% (0.9 kg), to aerodynamics 47% (1.14 kg). And when driving down the same hill the speed will increase to 43 km/h, pulling from downhill = 0.9 kg compensate the increased of losses on the air resistance = 2.2 kg. The values can “feel” with the help of calculator. Air resistance drag is correct to compare with riding uphill (or downhill), as hills gives a comparable contribution (in comparison to rolling resistance), even with a completely invisible slopes. Rolling resistance should be evaluated more details from experimental data. It is possible that coeff. rolling resistance in the network are strongly underestimated. The network has a remarkable experiment to achieve the speed at different power applied to the pedals. 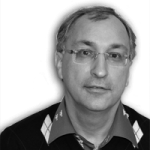 Link to the article “Interesting bicycle aerodynamics”(in russian). From there it is possible to take the data and clarify the contributions from the rolling and aerodynamics . This will be done in the following note.